Before I dropped my front subframe, I searched the site for articles that provided the details on how to do this. There were a lot of bullet pointed lists, one or two chronicles and a few older articles that no longer had working images or links. Althought the process is pretty straightforward, it is always helpful to have a little detail, so here is my attempt to provide it. Since I'm working solo on this car, I am breaking things down into one-person jobs. I already have my engine and transmission out, so this guide concentrates solely on dropping the subframe by itself. If you are dropping transmission, engine and subframe as one unit, you will need to disconnect a lot more pieces and the whole package will weigh, what, about 525 lbs? The subframe by itself with the steering box attached weighs about 90-100 lbs. It is not difficult to deal with, but you can't just let it drop either. You will need 11mm, 12mm, 14mm and 17mm wrenches and sockets, a breaker bar, a large flathead screwdriver to use as a wedge (or an actual wedge), a large pair of channel-locks to turn turn the screwdriver if using it as a wedge, some paper towels (for wiping brake fluid), some baggies for your parts and (2) 2-3 foot long bungee cords (for the struts). I also recommend getting a furniture dolly from Harbor Freight so you can set the subframe on it to move it around more easily. Oh, and a box of gloves. Here are the steps involved along with some images. I am assuming the battery is out or disconnected. Jack the car up and put it on jackstands. You can either use the jacking mountpoints or in my case I used the inner body frame members because I already had the car jacked up using those. Put the key in the ignition and turn it to acc to release the steering column lock. You will need this to rotate the steering shaft coupling. .
With 2 13mm wrenches, loosen up the steering coupling joint and remove the top and bottom clamp bolts. (There is a groove in the splines so you have to remove them completely. Don't forget to bag and tag them.) With a wedge or large screwdriver, loosen up the joint and slide it up onto the steering column shaft. This took a little work but I was able to do it by torqueing a large screwdriver with a pair of channel-locks. The coupling must be up above and completley clear of the steering box. Out-of-focus in progress and in-focus after completion images below. Next, disconnect the brake lines from the front struts using 11mm or 7/16 and 14mm wrenches. I chose to do disconnet the flex lines from the rigid lines on the struts. You will need to drain your brake lines if your brake system is intact. Mine was already partially broken down. Be prepared for brake fluid in any case. Oh, and be sure to save the connector pieces (two little pieces of spring steel) that will end up being loose. 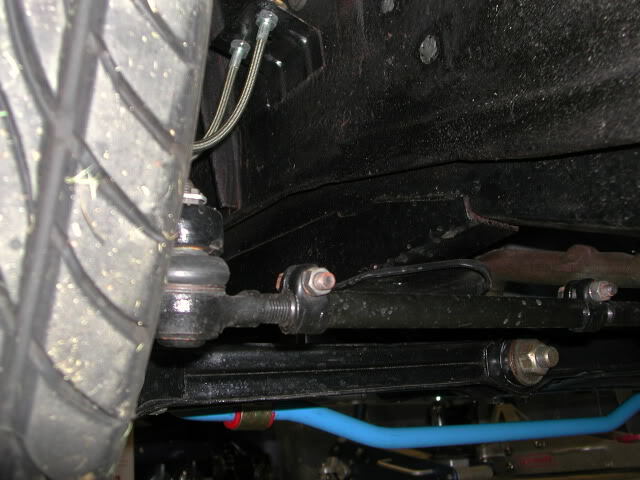 Once you get the brake lines disconnected, take the bungee cords, wrap them around the struts and secure them to the suspension on the subframe underneath. This will prevent them from dropping against the fender when they come free of the strut tower later. Next, with a 12mm socket, remove the bolts on top of the strut towers. They will not fall through (yet) and you do not need a spring compressor. Bag the bolts and washers. OK, now we get to the fun part! There are only 6 bolts holding this whole thing on and they are only about 18 inches apart on each side along the bottom of the frame rail. These require a 17mm socket and will probably require the breaker bar to loosen, although once loosened, mine came out very easily. I suggest that you initially remove the front and back bolts and just loosen the middle one on each side. Note that the front bolt is longer. There also isn't a lot of clearance to get a socket onto the rear bolt. With that one bolt still attached on each side, place your floor jack against the crossmember slightly off center a little closer to the steering box. It might not matter, but I did this in an effort to maintain balance. Jack it up snug and orient it so you can hold one of the struts as you are lowering it. Now remove the last two bolts and slowly lower the whole assembly to the ground. Don't forget to bag and tag the bolts. Surprise! It's done! Leave the bungee cords attached so that the assembly is easier to move without risk of a strut falling over. Of the many factors that can affect the handling of your '02, wheel camber is one of the most important. You can spend a large amount of money on tires, wheels, shocks and springs, and sit back and wonder why "lesser" cars continuously outpace you on the track. Chances are, they are just set up better, and part of this setup is getting the camber right. Negative camber is when the top of the tire tips inward, and positive is when it tips outward. Negative camber is necessary for good cornering performance. The main question is how much. When turning a corner the body rolls and the outside tire is forced to tip outward in relation to the road. This causes the tire to ride on it's outside edge and lose grip rather than being flat on the road. I refer to this as body roll positive camber. To maintain the best grip we would like the tire tread to remain flat on the road. To compensate for body roll camber change auto manufacturers design in some negative camber. Again the question is how much is the right amount. To improve cornering performance and reduce body roll camber change most tuners (us included) increase roll stiffness via stiffer springs, sway bars and lowering the body (lower center of gravity). Increasing negative camber is one of the most effective and inexpensive ways to improve handling but is often overlooked on street cars. Negative camber in the 2 degree range will have little effect on tire wear but can have a dramatic affect on reducing understeer. Insufficient negative camber is the reason many driver school students destroy the outside edges of their front tires. For perspective, the front suspension of race cars are usually set up with 3 to 4 degrees (or more) of negative camber. However, this much negative camber would quickly wear out the tires of a street driven car that spends most of it's time going straight. We at Ireland Engineering offer several types of camber plates. Fixed plates are usually the best choice for performance street cars. These add a fixed amount of negative camber and use the factory upper strut bearing. These are an economical path to upgraded performance without affecting ride quality. However, customers who want more aggressive performance and/or use their cars for driver schools, track days, or autocross usually use adjustable camber plates, or a combination of plates and having their strut tubes bent for additional initial negative camber (more on this a bit below). Race cars use camber plates with spherical bearings and solid slotted mounts. These offer no compliance but locate the suspension most accurately. We don't recommend these for street cars but some customers use them anyway, as we do on our dual purpose cars. With the racing plates you can expect increased vibration and noise. We also offer the KMac type adjustable camber plates which are similar to the factory upper strut bearing except they have a stiff urethane bushing instead of rubber. The KMac plates are made up of 3 plates which allow the center piece containing the strut bearing to be adjusted for both camber and caster and then clamped in place when the bolts are tightened. We now offer a new type of camber plate that is exclusive to Ireland Engineering that allows the use of the factory upper strut bearing and allows up to 1.25 degrees of additional negative camber. This plate also offers up to .5 degree of positive camber for cars that are radically lowered or to correct damaged suspensions. Please note that the amount of camber available is limited by the size of the stock top spring "hat" which hits the inner fender at around 1deg. of negative camber (or less). In order to make best use of ANY adjustable camber plate, we recommend the use of coilovers, which have a much smaller top spring "hat" which allows for more adjustability. It is also possible to get additional clearance with a little creative grinding! You will need a carpenter's square and a tape measure. With the car on relatively flat surface, place the carpenters square on the ground and against the tire. The square will be touching the side wall near the ground. Measure the distance from the same point on the side wall near the top of the tire to the square. Also measure the distance between the two data points. The tangent of one degree is .017. Therefore 1 degree of camber is .017" per inch. An example is: If the two points are 20" apart , then one degree is 20 x .017" = .340". There is a slight error due to the lower side wall bulging for the weight of the car, but you can easily estimate this. If you have any questions don't hesitate to post them to the Message Board! Changing the strut bearings means getting the struts out. I can deal with engines and drivelines, but I know diddly squat about suspension, so I got hopelessly confused by both the terminology, and by what attaches to what, functions how, and can move in which way. Hence, here's a pictorial guide to changing strut bearings. You know you will want to change yours if there are large cracks in the rubber support, even though I now realise that the consequences of the rubber support failing are not as dire as I originally had thought - it supports the damping rod, the force of the spring is on the metal plate on the bottom of the strut support. So, what is a strut bearing ? It lives right under the top of your fender, and you come across it as you open the hood. It looks innocuous, this tiny little black rubber contraption, fixed with three little nuts around the perimeter, and if you open up the half-domed cap on top, which just snaps on, you can see a self-locking 19mm nut. You recognize the strut bearing at the top. If the strut has to come out to change it, you have to somehow disconnect it at the bottom as well, or else make the wheel hub drop far enough down so that it can move outwards from the top of the fender. I thought I might be able to disconnect the three nuts at 24. They are safety wired, but more importantly, one of them cannot be reached at all with the brake backing plate in place, and to remove that, the wheel hub has to come off. That is a big no-no in my book. Disconnecting the strut bearing at the top will not allow it to come down far enough to move past the fender. The limiting factor here is the sway bar - nr 28 on the picture, which connects to the wishbone through the long bolt nr 33. So this is the first thing you do, before even jacking up the car - soak that bolt and the double nut on the other end in penetrating oil, and brush off all the dirt and rust with a brass brush. While the penetrating oil soaks in, crack the wheel nuts loose. They are 19mm. Bolts and nuts are 13mm, so get a long spanner or a ratchet, and remove the nuts. This is easier said than done. 48 years of rust will have you breaking a sweat, as the bolt is far longer than it needs to be. If the rubber bushings turn out to be shot, order new ones. Mine were fine. The bushings are in two parts, make a note of the order and orientation of the washers. The diagram has the bolt head pointing upwards, on my car the bolt head was on the bottom. I have no idea what is smarter, but it would have been easier to undo if the nuts would have been on the bottom I think. Obviously, you turn the nut, not the bolt, in order not to unduly stress the bushing. The rest of the pictures are of the right side of the car, but here is a comparison picture of how far the wheel can move down with the swaybar undone on the left side, as compared to the fully extended suspension with the sway bar fixed - on the right side. Once the sway bar is undone, you can crack the 19mm nut in the middle of the strut bearing loose. You may need to hold the 8mm hex head at the end of the damper rod with a spanner in order to do this - sometimes you will just spin the damper rod instead of the 19mm nut. In fact, if you are able to follow the instructions below to the letter, it makes little difference if you undo the nut completely. The shiny steel end of the damper rod may disappear out of sight into the depths, but that is fine, we'll get it back later. If you have a spring compressor handy, it might be wiser to not undo the nut completely, so you can keep track of the damper rod. If you have a spring compressor, now would be a good time to put it on the suspension spring as it is compressed by the weight of the car. I had no spring compressor. If your springs are tired and 48 years old like mine, you can get away with this. I'm not saying it is a very good idea, but you can get away with it. If you installed new, stiffer springs, there will be a moment in this story where you will get stuck. You will not endanger yourself, but you will get seriously stuck, until you get a spring compressor, and then you'll have to compress the spring with the compressor instead of using the weight of the car. Best to beg, borrow or buy a spring compressor before you start. Now, finally, you are ready to jack up the car. Place the car on sturdy stands. The middle of the subframe makes a good jacking point, the framerails or the end of the subframe right inside of the hinge point for the wishbones are good for placing stands. Once the car is jacked up, remove the wheel. The two bolts at the back of the brake backing plate which hold the brake caliper on are also 19mm, and can be undone with the same tool as the wheelnut. Once you have the brake calipers off, remember NOT TO TOUCH THE BRAKE PEDAL until they are installed again. You have to tie them to something so the rubber brake line is not stressed in any way. The swaybar, which is disconnected from the rest of the assembly anyway, is great for this. Now we are ready to undo the three nuts and their washers at the top of the strut bearing. Once you do this, the whole shebang will drop out of sight. Make sure it does not dent the fender from the inside. I suspect that if the spring has a compressor on it, that you can now simply move the whole strut outwards, and if you press down on the wishbone with your foot, it will clear the fender. However, I had no spring compressor. Which is why I undid the 19mm nut at the end of the damper rod competely and made a note of the order of the washers and spacers. Then, pushing down on the wishbone, I wiggled the strut bearing off the end of the strut while it was still inside the fender. The damper rod will slowly slide inwards under its own weight, but that is fine, we will get it back later. Now you need to concentrate on getting the strut out from under the fender. This requires a combination of leaning on the top of the spring to compress it and pushing down on the wishbone with your foot. I used a nearly finished roll of kitchen paper to make sure I didn't damage the fender. As the spring is uncompressed, it is very easy to reach through the coils, grab the damper rod, and push it back up until it fits through the hole at the top of the strut. Then mount it on top of the strut, and thread the 19mm nut back on for a few turns, using only a single washer, not the stack of washers and spacers that came out. We'll get to that later. However, do make sure that you thread the top of the nut past the hex bolt head at the end of the strut - you will need to be able to reach that later! Since your strut is now higher by the height of the rubber strut bearing, getting it back under the fender, using the same roll of kitchen paper, will be more difficult. This is where a spring compressor comes in really handy, as it would avoid all of these shenanigans - you could just place the strut bearing back on top, complete with its stack of washers and spacers, tilt the strut back under the fender and be done with it. Still, I managed to do it without, just pushing down on the wishbone and compressing the strut by hand. At this point, reassembly is really just the reverse of disassembly. The strut bearing has a fixed orientation, the bolt pattern will only fit one way. As soon as you have the studs through the holes in the fender (you will have to lift the wishbone with your foot e.g. under the brake disk), put the small 13mm nuts and their washers back on. The difficult part of the job is now done. Reassemble the brake caliper and put the wheel back on. Jack up the car, remove the stands, and drop the car back onto its suspension. While doing this, double check that the bolt for the sway bar is going back though the hole at the end of the sway bar. The weight of the car will now compress the spring, and also the damper rod. Get a pair of flat pliers, grab the hex head at the end of the damper rod, and pull it up as far as will go, which should be very easy. There is a definite positive stop to it. Then undo the 19mm nut, put the whole stack of washers and spacers back where they were, and thread the 19mm nut back on until it bottoms out. Hold onto the hex with an 8mm spanner if the damper rod turns along with the 19mm nut. 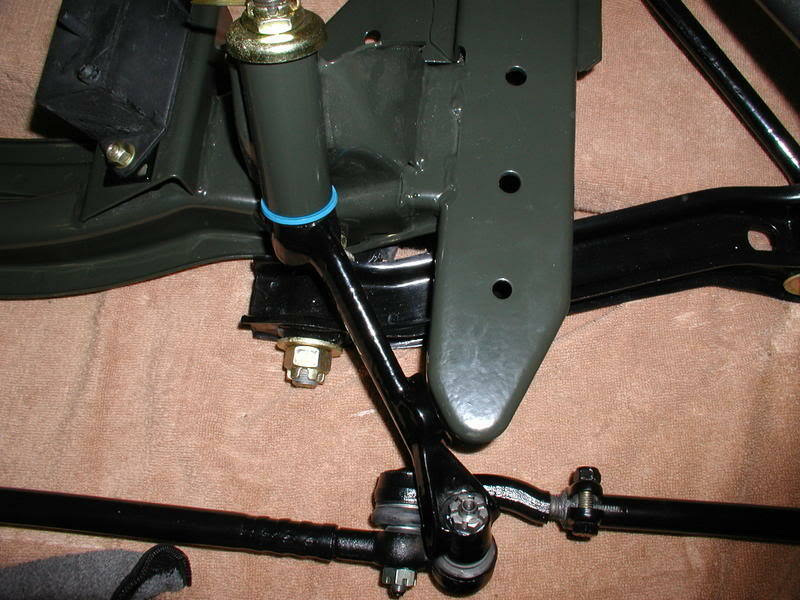 The last thing to do back up is the sway bar, with the wheel on the ground (n order not to unduly stress the bushings, and also because the bolt head or nuts will be much further away from the struts, making it much easier to fit a spanner), and finally torquing the wheel nuts with the wheel on the ground. You are now ready to start over on the other side. Total time for me doing both sides, finding my way as I went along, was about 4 hours. This write-up was revised on 8 Aug 2013. The photos in the original post were lost due to me fiddling around on Photobucket and breaking the links. I tried to recover most of what was originally there but some photos have escaped me. The suspension can be rehabbed in pieces or completely. Defining "completely" is scetchy. Completely can mean all of the bushings, brake components plus shock and strut components. Let's tackle the suspension bushings first. This is not a technical writing but a guide or forewarning of what to expect. There may be ways to rehab the suspension in the car but I will address the procedure as if the suspension is out of the car. Boy I feel inadequate to do this. Parts from a Paul Wegweiser list from years ago. Part numbers need verified, seems like BMW changes them often. I believe the control arm needs removing before you can rehab the idler arm. Remove the cotter pin and the castlenut, pop off the metal cap and persuade the idler arm to move down through the bushings. Remove the old bushing from the idler arm housing or off of the idler arm itself. It may require using punches, drifts or grabbing and twisting with vice grips. You can use the stock, turbo or urethane bushing. The black one is the turbo. This is a tired bushing and needs replaced. This is a home made bushing tool. It is a 1 1/2 inch PVC coupler cut in half, all thread and a series of washers. The concept is the washer that is bigger than the coupler has a washer up against it, the washers on the other end are the size of the bushing or a scooch smaller in diameter. As you tighten the nut against the large washer, the all thread and smaller washers pull the bushing through the PVC. The job of the piece of the PVC on the side being pulled through, keeps the bushing from "bunching up" before it pulls through the metal housing. I had to place a wrench between the two pieces of PVC to keep them straight. I am sure there is a more sophisticated way to do this. Use this tool to remove and install new rubber bushes. Urethane are split and install without a tool.Urethane bushes need lubed to reduce squeaking. 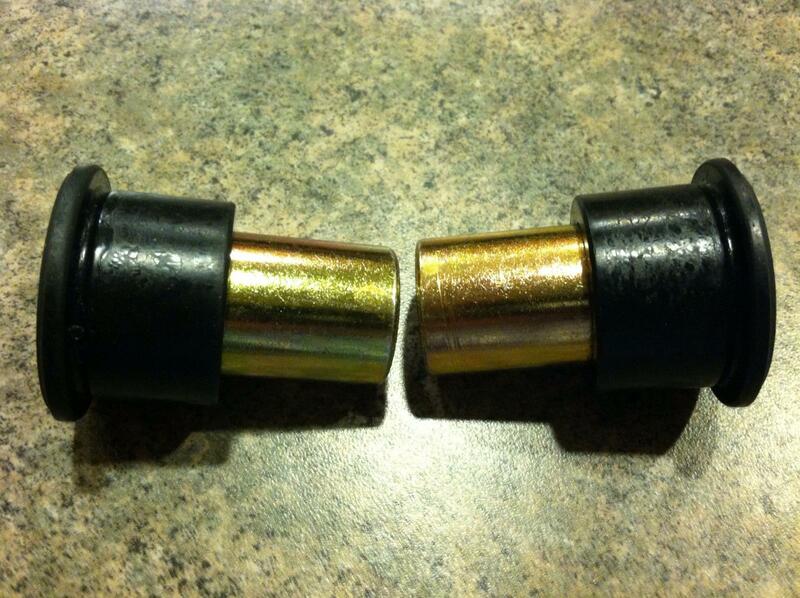 Sway bar bushes are pretty straight forward, just decide if you will use stock or urethane. Use hex cap bolts instead of hex head bolts. It is difficult to get a wrench or socket on the bolt head. Socket head bolts work the best. You can see the socket head bolts in the picture below. I used Spicer Teflon bushing for the end links. Urethane is readily available too. I do not like the the way I did the bolts above. I like the threads up. Saves them from getting buggered up from the road. There is a way to replace the inner and outer control arm bushes, they are different sizes and some suppliers have a hard time getting this straight so be careful if you order them. However, there is a lot to be said for just replacing the control arm. Inspect your old one and if it is bent from POs poor choice of a lifting point or if your not into removing the old bushes, just purchase the control arm and it comes with new bushes. I found this link (thanks to Jerry, Pinepig and Zenon) with great instructions on replacing the control arm bushing. The pictures below may help you get the spacers and washers in the proper order in case you did not document this well when it was disassembled. I failed to get good photos of the ball joint replacement. One of the big challenges is getting the bolt that holds the ball joint to the pitman arm off. Use your best and biggest tools to get it loose. Be diligent in using the right grade of bolts. New ball joint kits come with the correct hardware. Grade 8.8. When you attach the struts to the pitman arms, most will recommend to use the bolts with the nut with the hole in so all three bolts can be safety wired together part number 32 21 1 113 178. Some will make an argument that high grade bolts with locktite is safe. BMW recommends the safety type bolts and safety wire. I have done it both ways. One of the harder parts in replacing the strut inserts is deciding which ones to use, Bilstein HDs or Sports, Boge, Koni, etc. Once you decide, disassemble the strut assembly using safe spring compressors. Most strut inserts have a socket head on the end of the strut so you can hold it while you spin the Nyloc nut loose. You may find some poo inside the strut tube. Many stories on what it is and why it is there. No need to replace whatever it was. Be careful trying to coat the inside of the tube with paint or POR-15. It can make things too tight for the insert to go back in. Reassemble and use new strut bushing if you need them. I believe the ones for the e-21 (GUIDE SUPPORT M8X18 31 33 1 110 195) have shorter studs and make the top of your inner fenders look tidier. Lube the strut bushing bearing. I like that good red grease for this. The photos below is my youngest son, Revvin Evan, doing the safety wire for me. He does all the connectors on his bike so he is pretty good at this. Safety wire is available at speed shops, bike shops, JEGS, Summit etc. The safety wire tool makes spinning the wire easy. When you install the struts on the pitman arms, use new safety bolts and safety wire. Wrap the safety wire so it traps the bolts and does not let it turn. Shortened or shorter springs want to move from the rubber pads when the car is jacked up. To seat them properly involves putting your hands around the springs when the car is lowered. To eliminate this, the springs can be wired to the upper metal cap. Drill a hole in the cap and use a stainless steel wire to catch the upper coil on the spring and the spring will stay in place when the car is jacked up. go with the .028" wire and/or 0.032"
Safety wire pliers. Just buy a pair just like the ones in the picture. These are available at larger bike shops, racing supply companies, and even JC Whitney. Some people might suggest that you can use a "twirl tool" or a pair of needle-nose pliers, but you will be much happier with a pair of real safety wire pliers. Borrow a pair if you must. A can of stainless steel safety wire. Some racers use ½ to a full pound can per season. The best overall size to buy is .032" diameter, although having a can of .028" and some .050" can be handy for tight spaces or damage repair. Safety wire is available at most motorcycle shops. A variable speed drill and a dozen 1/16" drill bits. If you have access to a drill press, that can make the job faster. The tiny drill bits will only last 4 to 6 bolts. They will break often, even if you're careful, and dull quickly. Pick up a few 3/32" bits also. Be sure to keep the bit lubricated while drilling. Except for a few places on your bike where bolts are already drilled for a cotter pin, the nuts and bolts on your bike will have to be drilled before they can be wired. There are various ways to do this. It is best to use a drill press and a small vice to hold the fastener or part. Whether you have a press or a hand drill, here are some tips. First, go easy with those little drill bits. It takes very little force to break one. Lubricate the drill bit periodically with light oil. This helps it cut faster and also cools the bit. When the bit is about to clear the far side of the item you need to be careful that you don't snap the bit. Many nuts and bolts are surface hardened and that last section takes the longest. Throw out a drill bit when it gets dull. Most bolts can be drilled straight through the hexagonal head, as in the first figure. Drill from flat to flat, and keep the hole centered. For the studs of some mounting bolts where a portion of the threads protrude, you might opt to drill through the shaft and wire in the fashion of the cotter pin found in most rear axles. If you do this, put a nut on the bolt first so that you can clean up the threads by taking the nut off. Banjo bolts (used on brake and oil lines) are hollow and cannot be drilled straight through. These must be corner drilled, as shown in the next figure. Hexagonal nuts are drilled across one of the corners. This is a three step process. The drawing shows the drill bit pointed at the flat of the nut. Drill straight in until the bit is in about 1/16 inch. Then turn the nut in the vice about 15 degrees. Continue drilling until the bit is in about 1/8 inch. Finally, turn the piece again so that you can drill all the way through the corner. Allen head bolts may be drilled through either one or both sides. Be sure to drill though the flats of the allen or you will weaken the grip offered the allen wrench. Drilling through both sides will make wiring the bolt easier. Once you have the nuts and bolts drilled and reinstalled, you need to wire them in place. You should first ensure that everything is torqued properly. Over-torquing a fastener will weaken the threads, and repeated over-torquing can lead to failure. Your bike's manual will have the torque and thread treatment specifications for each fastener. If appropriate, loctite or lubricate the threads first. You then need to wire the item as an insurance procedure. When wiring nuts or bolts, there are several techniques used. The first is to wire the nut or bolt to a convenient fixed object, such as the frame or a fork tube. Another common technique is to wire two or more fasteners together so that none of the fasteners can back off. 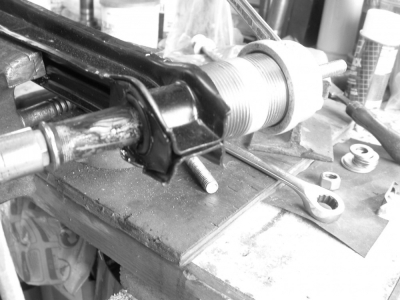 A third approach is to wire the head of a bolt to the nut on the other end. The figures show the first two of these techniques. Most drain or fill plugs will be wired to a frame member or engine part. Brake caliper nuts and bolts are usually wired together. Fork pinch bolts can be wired together or to a fixed item. A muffler mounting bolt is usually wired to its own nut. The figure on the left shows a nut wired to a fixed member. It is best to start by looping the wire around the member and twisting the wire together. Continue twisting until the twisted part reaches just short of the nut or bolt. Thread one piece of the wire through the hole on the nut or bolt. Pull the wire tight and then continue twisting the wires together. Leave about 1/2 inch of twisted wire and cut off the rest. Throw the ends in the garbage can immediately. Tuck the end around so that you can't cut yourself on it. Tension should be kept on the nut or bolt in the tightening direction. The diagrams here show the wire in a loose fashion so that you can see the idea. Your completed wiring should be neat and tight. Always discard your excess wire in a trash can. Those little pieces of wire can flatten a tire in no time. Always use caution when working with safety wire. The ends are very sharp and can easily cut your fingers. When you have finished wiring a nut or bolt, bend the end of the wire so that it doesn't protrude and create a hazard. This figure shows two nuts wired together. The procedure is similar to wiring to a fixed object. Loop the wire through the hole of one of the nuts (or bolts). Twist the wire and maintain tension on the wire in the tightening direction of the nut. Continue twisting until the twisted wire reaches just short of the hole for the second nut and wire that nut. The wire should pass between the nuts to maintain tension on both nuts when the job is done. This process may be continued to wire additional nuts in succession, such as an oil filter cover, sprocket nuts, or water pump. If your bike has a spin-on type oil filter, it can be wired in place by placing a hose clamp around the filter, then running a piece of safety wire from the clamp to the frame or another fixed object. Another area which requires special techniques is fuel and water lines. You can use the spring loaded clips that come stock on most bikes, or use small hose clamps. If you use safety wire, be careful because you can cut through the hose by using too much tension. Small zip ties will also work. Water lines are usually clamped with standard hose clamps. One precaution you can take is to thread same safety wire through the slot on the screw of the clamp, then attach the wire to the clamp. This will keep the hose clamp from loosening. The car needs supported some place other than the usual place on the subframe. I run a 4x4 across the car in front of what BMW calls the Push Rod (these are the bars that connect the sub-frame to the body) and set that 4x4s on jack stands. Disconnect the flexible brake lines and curse the nastiness of brake fluid that goes everywhere but in the pan. Disconnect the emergency brake cables, shocks, differential support bracket, two large nuts that connect the suspension to the body, support bars and the driveshaft. You may find disconnecting the shocks easier from the trunk. On most shocks there is a allen socket in the top of the shock, you can place a box end wrench around the nut on the top of the shock, hold the shock securely with the allen wrench and loosen the 17mm (guessing) nut on top of the shock, that is usually a nyloc nut. Disconnect the drive shaft with a friend. Engage the parking brake, break loose one of the nuts on the drive shaft at the differential. Have your friend release the brake, rotate the shaft, engage the brake, break loose the next nut, so on and so on. By the way, after you have done this once, you will find a way to put a set of flex head gear wrenches in your tool box. Working these nuts is worth the price of these wrenches. Lowering the suspension justs involves placing a floor jack under the differential and lowering it slowly while balancing everything. The spring will just fall out as you lower the suspension. Going at it this way allows you to refresh the brake fluid and the flexible brake lines. Tired rear suspensions look like this. Again, this parts list is old, one I got from Paul Wegweiser years ago. Part numbers need verified, seems like BMW changes them often. As a note, install the end of the flex line that attaches to the bottom of the car first, even before the sub-frame is placed. For some reason BMW placed that connection just above the rear sub-frame and it is difficult to get to once the sub-frame is in place. Inside the sub-frame is a captive nut like thing that holds the hex head thing on the flexible brake line. As with the front sway bar link bushings, these are pretty straight forward. Just decide on what you want, stock, urethane or teflon. 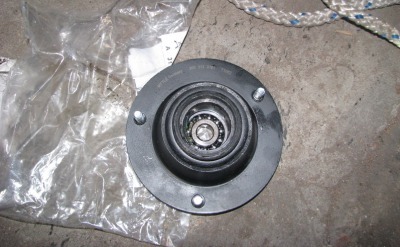 Even though replacing the bearing races and seals are not covered in this post, one method of pulling the hubs is shown along with the spacers inside the rear hubs. Removing the trailing arm bushing is accomplished in several ways. One way is to stink up the place and burn the rubber out and then remove the steel sleeve. The way shown here is using a BMW bushing removal tool. A homemade tool with PVC, washers and all thread works too. Once you know how to use the tool to remove and insert the bushes, it is an easy process. Not a big deal to replace these. Just find a way to remove the old ones, prising with a screw driver works, them just lubricate with your favorite soap or glycerin and push them in from the top. The rear carrier bushings come in a "bolt-on" unit. To replace, just unbolt the old unit and re-bolt the new unit on. Just be aware, the units for round and square light cars are different. Note: Insert the bolts in the bushing unit then insert the bolts through the sub-frame. The bolts can not be inserted if you place the bushing unit flush against the sub-frame. Nobbs go up! The rear carrier is different for earlier and later cars, be careful ordering parts. The rear carrier bushes can not be flipped on early cars. BMW used to offer the carrier and the bushings as one unit, now they only offer the bushings. To replace these, I had them pressed out and the new ones pressed in with a press. Caveat - I have no association with the tire business whatsoever, just sharing what I found with fellow 02ers. I looked around all the tire shops locally and spent a good amount of time on the internet as well. For those of you wanting to stay with a 13'' X 5" OEM steel wheel you'll soon find that tire choices are a bit limited. They're out there, but the 185-70r-13 is extremely limited. However, I did find a Toyo 185-70-13 which appeared to be a decent tire and was available at one of the tire stores. Bottom-line on the 185-70-13 is this, unless you're looking for a snow or winter tire, good luck as they all seem to be discontinued. Now, if you go with a 175-70-13 (just less than half inch width of the 185, it opens up a whole new list of tires available, but still limited. 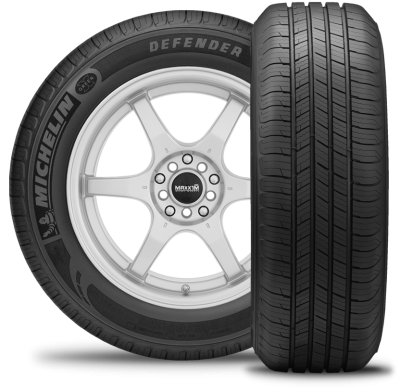 I decided on the Michelin Defender XT 175/70/13. Available from "Tire-rack" for around $83-85 each, but I'm a COSTCO member and picked them up there for $85, and they did the mounting etc. My logic for purchase flows like this: 1. I've been running the Michelins on my wife's Jetta and have really liked them, they handle well and are quiet, so basically I had a positive history experience. 2. I was looking for a firm sidewall to compensate for the 70 aspect ratio, I didn't want a soft tire with much side roll and this one seemed to meet that criteria. So, once Becky is back on the road, I'll give a read-out on how they perform, as I do considerable mountain driving. A few pics attached, wanted to show you the rubber mounted and the contact measurement with ruler. While I had my subframe out I fixed my leaking steering box. Mine was leaking from the input shaft. I had the steering box on my work bench and I was able to remove the shaft seal without taking the steering box apart. I did this by poking a small screw driver along the side the input shaft and into the inside edge of the seal and prying up, working my way around. I was so happy when the thing popped up! At first I tried poking a hole in the seal to dig in an pry up, but the seal started getting pushed in and I found that the seal had metal inside it. I had already obtained a replacement seal The size is metric and marked on the seal that I read with a magnifying glass. I got mine from Motion Industries for $2.17 as I could drive to one of their places. When I got it the packaging revealed that Motion got it from this place that might come in use for someone. I hope the pitman arm end of the thing doesn’t start leaking because that will be a bear to get the arm off. Most bearings and seals have their specs on them so you can usually get a replacement for these from a generic dealer if not BMW. I got my transmission bearings and seals this way, years ago. I came cross this thread (originally was posted by @jerry in Dec. 2006) while was planning to rehab control arm bushings in my car. I read folks talk about replacing entire control arm because is difficult to press new bushings in. So I decided to give it a try on only one arm and see what happens. Well, it worked and procedure is SPOT-ON. Thanks to Author (Jerry). Following is the link to original post. The procedure is also copy and pasted here just in case the link not working properly or is broken. folks, a big hearty thanks to Pinepig and Zenon (and another FAQer whom i've forgotton, who i took the plumbing fitting idea). anyhow, these bushings have been installed, and with the proper setup and tips offered, this job is very much doable and rather rewarding. the key was Pinepig's use of bailing wire to wrap the rubber bushing. i used the wire that is made to tie rebar for cement forms; commonly available and cheap. cut off about 18 inches or so and wrap around the center portion of the bushing. it does not have to be perfect nor necessarily tight (see photo). assemble a nice pulling tool. i saw a fellow FAQer's use of galvanized pipe and copied it. i ground to small scallops for clearance as shown (see photo). these allow it to seat squarely on the Control Arm (don't want an akward angle to add to the effort). buy a handful of hardened washers and a couple spare nuts. i took Zenon's comment to heart, not to apply load to the rubber. i accomplished this by salvaging the center tube from the old bushing. use a hacksaw to slice it lengthwise in 2 places. you will still need to pry it off. as Zenon said earlier, these things are tough and can take the abuse. you'll notice that i still have residual rubber on my tube. the setup should be self evident from the photos. as the bushing is pulled into the hole merely pull the wire one wrap at a time to clear it. IT WORKS and the effort is minimal. i was able to use my wimpy all-thread rod without fear of pulling the threads apart or mashing the washers. this was tremendous difference from my earlier effort. pull the bushing past the spot you think it needs to go so that you can properly seat the outer flange. you can adjust the final position of the bushing by reversing the tool and pulling in the opposite direction till it aligns as you want it. That's all there is to it. Very rewarding and a much less costly alternative to replaceing the entire control arm. I found using an ACME threaded rod and a thrust bearing to significantly ease the effort of installing the bushing. These can be purchased from McMaster-Carr. Also, I strongly advise the use of Silicone grease (not petroleum grease). Dow Corning makes some for labratory glassware. the glycerine is not nearly as effective. Liquid Soap has been suggested but i have not tried it. Need to do your yearly front wheel bearing maintenance? this description outlines basic process for doing this on 320i hubs, but the process is similar for 2002 hubs. unbolt calipers from struts. hang them from springs. do not let them dangle by the hoses. pull hub off axle. keep finger on the outer washer so that outer bearing does not drop out. put hub on work bench on clean paper. do not want to get dirt in the bearings. clean all the old grease off the axle so that you can examine it for damage. here is your chance to use those goofy angled screw drivers that come in the screw driver sets. use the flat blade part to reach down inside hub to tap out the inner grease seal without damaging it. pull out the inner bearing. clean it out. any degreaser or brake cleaner will work. make sure they are fully rinsed and completely dry before repacking with grease. pack with grease. i use vavloline synpower but that is probably overkill for a street car. you can do this by hand or use one of those plastic bearing greaser tools. i do it by hand. just make sure the thing is full. clean out hub and examine bearing races for damage. pack inside of hub with grease. i don't know if there is some specific amount, i have always just filled the recesses with a few fingerfuls. replace grease seal. fill back of seal with grease before inserting. clean and repack outer bearing. insert in hub. assemble the hub and slide back onto axle. keep finger on outer bearing so it stays on. adjust bearing load. basically you want to snug it up to set the bearings, spin the wheel, then back off a little bit at at time until you feel smooth wheel movement with a touch of play when wiggling from 12 and 6 o'clock positions. a touch is defined as you can't really see it move, but you can feel just a little movement. put cotter pin back in. replace grease cap. tap in with hammer. i do not fill the grease cap with grease, but some folks do. no harm in extra grease. recheck wheel bearing play after a few days of driving. need new bearings in the hub? keep the workspace CLEAN! don't get dirt in the new bearings. 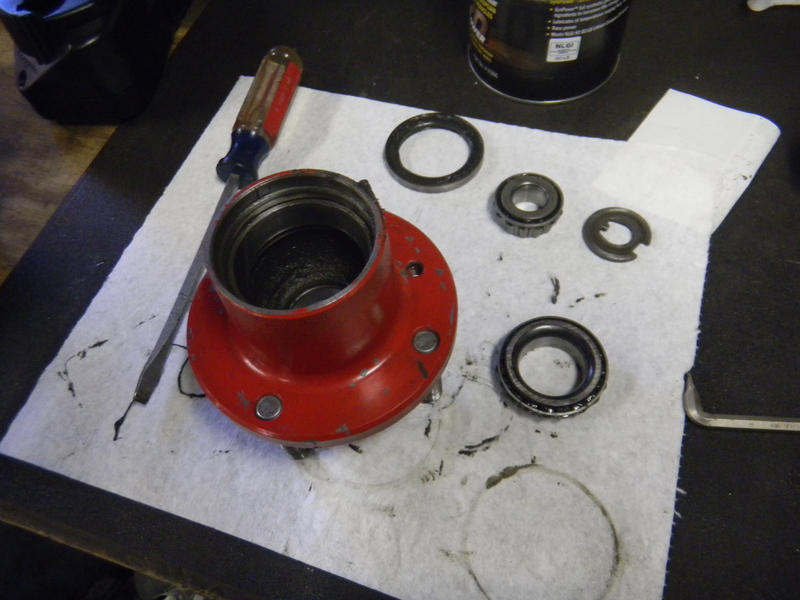 grease up the roller bearings and fill the hub. this is how much i used on one hub. can was new when started. I have been struggling with one part of my front subframe/suspension rebuild for a few weeks - the steering idler arm bushing. Getting the old one out was tough enough, but that was nothing compared to finding a replacement part. I wish I had researched more beforehand to understand the options for owners of early cars with the 29mm idler arm bushings before I pounded the old ones out and destroyed them. It's well documented on this forum that the bushing part # 32211115116 is not suitable for early cars and no amount of "soaping" or other lube will ease it into the tube. The blue plastic cladding is just too larger diameter. If you order the other bushing listed, part # 32212475055, you'll likely get a bushing that is metal clad like the original part you destroyed on removal, and the right diameter (29mm) but way too long. The forum has numerous reports of this happening from all the reputable suppliers - the BMW parts listings are flat out wrong. Luckily, the diameter of the idler arm itself appears to have remained the same when the sub frames switch from early to late styles. Leave the original parts in situ. If they ain't broke, don't fix 'em. Protect them from the sand blaster and mask them off for powder coating. Find some NOS original parts and do a like for like replacement. If you find a source for the original part, please let the forum know! I can tell you that Walloth & Nesch do not have them at the time of writing. They will send you the wrong part. Junk your early style front subframe and source one of the later ones, and safely order part # 32211115116 with the blue plastic cladding. Keep your early subframe, purchase part # 32212475055 and find a way to trim it to length. See below for measurements. This next option is rumoured to work, but I have not tested it personally. Keep your early subframe, remove only the inner bushing sleeve and rubber, leaving the metal cladding in place and unmarred. Cross your fingers, order part # 32211115116 with the blue plastic cladding, and remove the blue plastic cladding. Apparently 32211115116 with the blue plastic cladding removed can be satisfactorily pressed into the original metal cladding still left in your subframe. I got a little deep into this.. and the next option shows. Find a idler bushing of similar/same dimensions from a different application and give it a whirl. If you're looking at US domestic alternatives, bushing outer diameter of 1.14 inches and inner diameter 0.625 inches are the keys. See below for measurements. I tried all the usual Euro brands (myele, Sachs, boge, lemforder, etc) without success. It's likely there is a Euro alternative, but finding dimensions was impossible. However, heavy scrutiny of the Moog parts diagrams and dimensions turned up part # K8139 which is an idler arm bushing used on some 1964-65 Ford Fairlanes. They show up on ebay regularly as NOS and I'm sure some of you domestic car guys could easily run down a set. They're cheap too. 30 minutes later I purchase a set of Energy Suspension bushings, part # 9.9111G, of ebay for $8 including shipping. Got them delivered in two days. Fitted like a glove! No miles on them yet. I suppose I should report back in a few months when my car is back on the road. alignments are easy on 2002's. here is one simple way to approach the job. Other who have done this or want to add the “string method” chime in. here is a 5min how to on setting alignment on a 2002. If you are starting from a recent suspension assembly, eyeball the front wheels straight, put the steering box in the middle, and the steering wheel centered. Make sure the tie rods are the same length. If checking toe on an intact car or have completed the above on new front parts.. Put car back down. remember to roll the car forward and back a few times after jacking to allow the tires and suspension to "relax". Or what you have in the garage..
Run one tape in front of wheels, one tape behind. Hook dumb end of tapes on far plate. Read tapes on near plate. Make sure plates are against tires and tapes are tight. If front measurement smaller than back you have toe in. front bigger equals toe out. 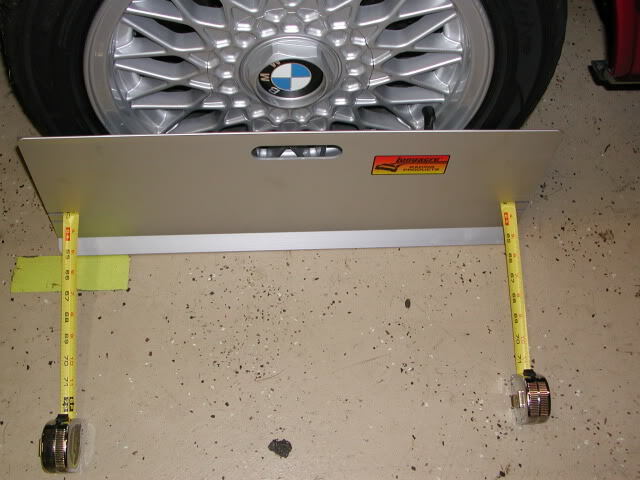 After each adjustment, roll the car back and forth a few feet and measure again. Once you have the toe where you want it, jack front back up and tighten the adjuster lock bolts back up. Done. Then get out your digital camber/caster tool…. Ideally your local wheel alignment store will have these specs in their computer, but it wouldn't hurt to have these in hand when you bring your car in. If you are setting your toe by hand, be as accurate as possible as the specs are fairly fine and most likely within the margin of error of any hand-setting technique. "Toe" is the setting of the front wheel alignment that specifies whether the two front wheels point inwards at each other at the front, or not. Toe-in is when the front wheels do point inwards at each other (slightly), and toe-out or negative toe is when they are splayed out from each other. Individual toe for each wheel is added together to get the total for the front axle. On our racecars, for short & tight tracks we run a lot of negative toe (toe-out) to help turn in characteristics. But that won't work on the street, and massive toe-in won't help anywhere. A little bit of toe-in on a street car is useful to ensure the wheels point straight when moving forward, as forces working on the bushings cause the wheels to splay out. If you have stiffer/less compliant bushings, then less toe-in is needed to counteract those driving forces. BMW specs shown in the service manual & the owner's manual have slightly different values. These are "total toe" for the front axle, cut the number in half for individual toe. If you are doing it yourself at home, then the distance (like 0 to 1 mm) is useful to read off the tape measure. Be aware that you will likely be measuring at the tire tread, and the factory distance value is from the rim. Won't really matter, as the difference is less than the presumed accuarcy of the method, and it's probably better to err on having less toe anyways. If you decide to take your car to a shop's alignment rack, the tech may not know how to change his machine's display units to read distance (1 mm) or degrees/minutes, so that's where the decimal angle spec is good to know. For a reasonably tight street driven 02, I'd say ask for total front toe of around 0.15 to 0.20 degrees. I just had to set toe on my 98 Compact, after installing late E36 M3 lower control arms which have a different geometry. These M3 LCA's feature more caster, achieving that by placing the ball joint approx. 10 mm forward of the standard E36. I put the LCA's on with solid motorsport bushings (not offset), and the geometry pushed the toe out 38 mm ! I used longacre toe plates to reset that to near 1 mm toe-in before I could test drive it. I've checked it a again since the install, and the measurement is repeatable & the car feels good. Still, there is no substitute for a computerized Hunter alignment machine for checking and setting the whole front & rear alignment specs accurately.